Mythical figure of jazz-fusion UZEB is back after 25 years of absence, LP! UZEB is the flagship group of Jazz Fusion, a musical phenomenon that has sold more than 500,000 albums, and played nearly 1,000 concerts worldwide. Always this incredible sound, an absolute instrumental mastery that propels the group to the forefront of his musical style. 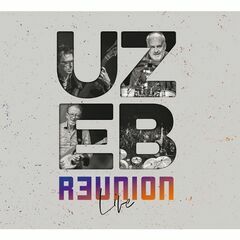 Today, with their respective experiences, Michel Cusson (Guitar), Alain Caron (Bass) and Paul Brochu (Drums) are back to the delight of their fans with UZEB R3UNION LIVE recorded during the tour in 2017 to Canada and Europe and, best of all, with a horny brass section!